A brilliant gift for any family who love to get cosy! Looking for a new home gift or a present for the family? 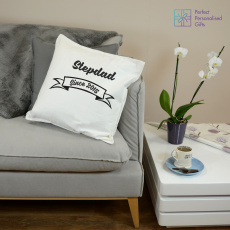 This Family Cushion is perfect for any family that love to get cosy on the sofa! Personalise this wonderful gift with the family name to make it a unique gift. The words ‘THE’ and ‘FAMILY’ and the wreath design are fixed. It's a wonderful gift for a new home, an anniversary or just because! Please make sure you check the spelling and grammar of your personalisation before purchasing as we will personalise the gift exactly what is entered into the personalisation field.